Every day we see small grasses, shrubs, herbs, plants and trees around us, all this vegetation is growing in soils. We play in the ground covered with soil. The beautiful parks built in your neighborhood are built on the soil. Thus, the soil is an important part of our surrounding environment. It is an important resource that decides the diversity of life in an area. But what is Soil? can you describe it? and have you wonder how it is formed? and what are various processes involved in soil formation? The soil is a thin layer of grainy substance covering the surface of the earth. It is a mixture of small rocks, minerals, bits of decayed living organisms (also called humus) and also various microbes. Humus is provided by the decomposition of the dead parts of plants and animals and the mineral nutrients are supplied by the weathering of rocks. 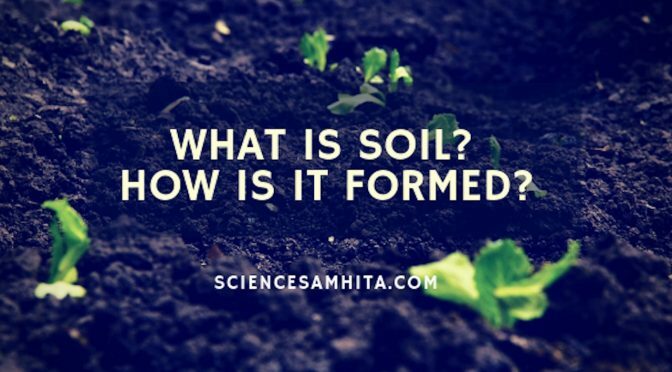 The type of soil depends upon the size of particles found in it, whereas the quality of the soil is decided by the amount of humus and microbes found in the soil. However, the mineral content of the soil depends upon the rock from which it was from. 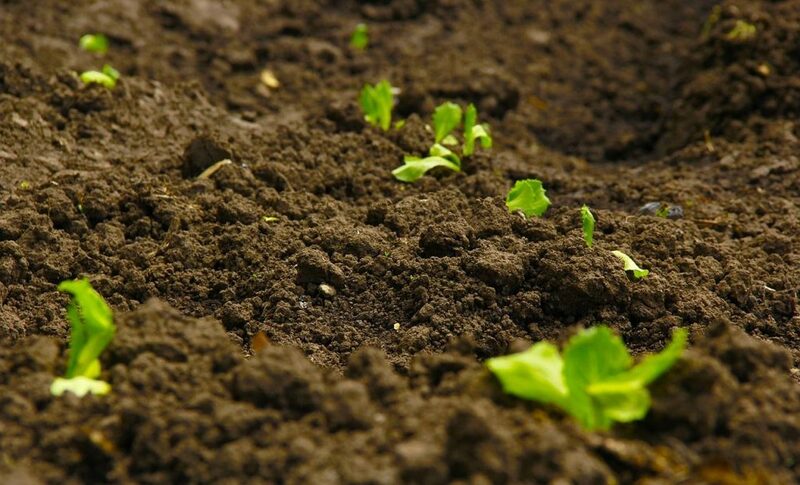 The right mix of minerals and humus make the soil fertile and also decide which plants will thrive on it. The soil is a mixture of small rocks, minerals, bits of decayed living organisms (also called humus) and also various microbes. Over long periods of time, thousands and millions of years, the rocks at or near the surface of the Earth are broken down by various physical, chemical and some biological processes. These processes act either individually or together in order to break down rocks into their fragmental states. All these processes are collectively called weathering processes. These weathered rocks are then colonized by bacteria and some small members of plant kingdom such as mosses and lichens. The dead remains of these organisms help in humus accumulation in the soil. The humus causes the soil to become more porous and allows water and air to penetrate deep underground, and finally a mature soil, a complex mixture of mineral and organic products forms. What are the factors that make soil? The major factors of soil formation are the nature of the parent rock and climatic factors such as temperature, water and wind, and the presence of living organisms. Other factors are the topography or relief, and the time taken for the soil formation. All these differ from place to place. The factors that affect soil formation. Soil formation depends upon the texture and structure as well as the mineral and chemical composition of the rock debris/deposits. The nature of parent rock determines the color, texture, structure, chemical properties, permeability, mineral composition and various other feature of the soil. For example, soils formed from granite are often sandy and infertile whereas basalt breaks down to form fertile clay soils under moist conditions. Climate is probably the most important factor in soil formation. The climatic factors such as temperature or heat, availability of water, and winds play an important role in soil formation. The Sun heats up rocks during the day so that they expand. At night, these rocks cool down and contract. Since all parts of the rock do not expand and contract at the same rate, this results in the formation of cracks and ultimately the huge rocks break up into smaller pieces. Moreover, temperature also influences the chemical and biological activity in the soil. Water helps in the formation of soil in two ways. One, water could get into the cracks in the rocks formed due to uneven heating by the Sun. Later on, when this water freezes, it expands and causes the cracks to widen. The widening of cracks results into the break down of these large rocks into small rocks. 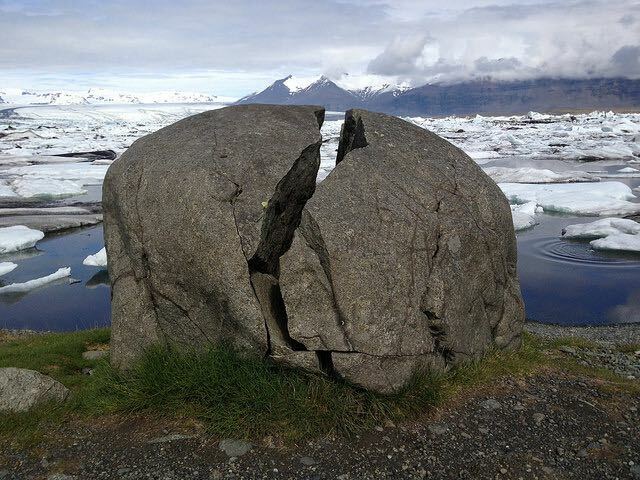 Weathering (crack formation) of a rock in Iceland, caused by repeated freezing of penetrated snow or meltwater. Two, flowing water wears away even hard rock over long periods of time. Fast flowing water often carries big and small particles of rock downstream. These rocks rub against other rocks and the resultant abrasion causes the rocks to wear down into smaller and smaller particles. The water then takes these particles along with it and deposits it further down its path. In a process similar to the way in which water rubs against rocks and wears them down, strong winds also erode rocks down. The wind also carries sand from one place to the other as water does. Living organisms such as plants, microbes (bacteria & fungi), burrowing insects, animals etc. also influence the formation of soil. The vegetative cover and organisms that occupy the rocks from the beginning, help in adding organic matter, moisture retention, nitrogen etc. Dead remains of these organisms provide humus, the finely divided organic matter of the soil. In the beginning, lichens grow on the surface of rocks. While growing, they release certain substances that cause the rock surface to powder down and form a thin layer of soil. As the soil forms, other small plants like moss, begin to grow in it and cause the rock to break up further. 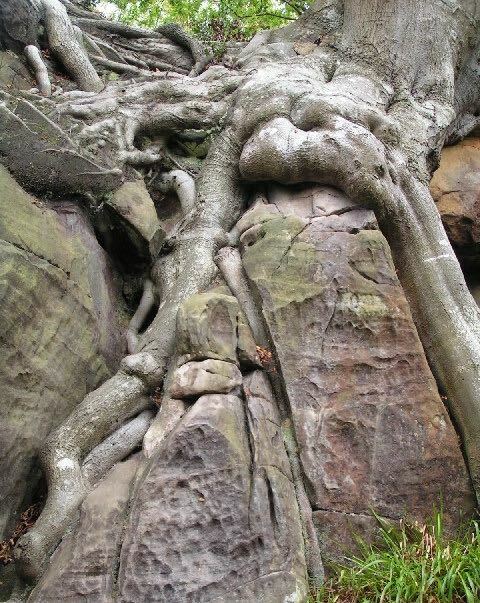 As the soil layer gets thicker, large trees take their place and the roots of these trees go into cracks in the rocks and as the roots grow bigger, the crack is forced bigger. The plant roots go into cracks in the rocks and as the roots grow bigger, the crack is forced bigger. However, the role large animals like ants, termites, earthworms, rodents etc., is mechanical, but, it is nevertheless important in soil formation as they rework the soil up and down. In the case of earthworms, as they feed on soil, the texture, and chemistry of the soil that comes out of their body changes. The topography or relief refers to the position and slope of the landscape. 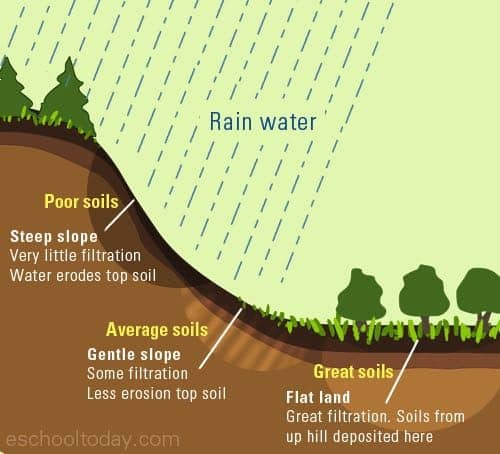 The aspect of slope determines the type of soil and indicates the amount of rainfall received. Steep and long slopes mean water will run down faster and potentially erode the surfaces of slopes. Thus, the soils on steep slopes will be thin and shallower. However, over gentle slopes where erosion is slow and percolation of water is good, the soil formation is very favorable. Thus, the soils over gentle slopes and flat areas may develop a thick layer of clay with the accumulation of organic matter. Also, slopes may be exposed to more direct sunlight, which may dry out soil moisture and render it less fertile. Time is also an important controlling factor in soil formation. The length of time the soil forming processes operate determines maturation of soils and profile development. Younger soils have some characteristics from their parent rocks, but as they age, the addition of organic matter, exposure to moisture and other environmental factors may change its features. Soils developing from recently deposited alluvium or glacial till are considered young and they exhibit no horizons or only poorly developed horizons. A soil becomes mature when all soil-forming processes act for a sufficiently long time developing a profile. It may take decades to several thousand years for a soil to develop a profile. Fundamentals Of Physical Geography. 1st ed., NCERT, 2006. Science – Textbook For Class IX. 1st ed., NCERT, 2006. Social Science – Resources And Development. 1st ed., NCERT, 2008. “Ecosystems In The Soil”. Eschooltoday.Com, 2018, http://www.eschooltoday.com/soils/soil-ecosystems.html. “How Soils Form | Environment, Land And Water | Queensland Government”. Qld.Gov.Au, 2018, https://www.qld.gov.au/environment/land/management/soil/soil-explained/forms. Previous PostWhat are different factors that affect the growth of plants?